We specialize in transforming West County outdoor spaces into beautiful places. We offer a full line of outdoor construction services and landscape installation. When you are considering your dream outdoor space, it will be important to have a well thought out plan for not only the construction aspects, but how the landscape will look and how the landscape will mature to create years of enjoyment for your beautiful space. You may want a few shrubs replaced or your whole landscape wiped clean to start over. For landscape designs, we charge $65 per hour for the owner, Nick Miller to customize a plan and design for your home. If you hire us to install the landscape, the design is free. There are several factors to be considered in a well designed landscape. For most of the properties in our area, plant varieties which deer tend to avoid are paramount. Other considerations include the amount of sun light during the day, morning sun, afternoon sun, soil conditions, drainage quality, and the functional purpose of the landscape. Do you want to screen the neighbors RV or do you just want some fantastic trees to see every time you walk out the door. Do you want color in the summer? Everyone wants low maintenance... For all of our no maintenance landscape designs we also include a free unicorn. Each plant is different and has different needs. For our planting installations, we over dig our planting areas and enhance the soil to ensure the plant has the proper drainage, fertilization, and depth. Our plants are guaranteed for 1 year after installation. Click HERE for more information on our landscape construction offerings. We have carefully selected vendors for our decking materials to ensure your deck has years of longevity. We guarantee our workmanship for 5 years and our experienced construction team undergoes annual continual education to keep up to date with the best practices in our industry. If you are looking for a new deck or a replacement deck, we will sit down with you to listen to your goals for the space and create a design that best suits your home. All estimates are free and we don’t charge for ideas. Whether you are needing to replace a dilapidated tie wall or want to change the grade of your back yard, we can design and offer competitive pricing for a beautiful wall. All our retaining walls over 4’ have an engineered drawing and permit through St. Louis county. We guarantee our walls for 5 years for any workmanship defects. There are a myriad of wall materials to choose from to suit the look you want. If installed properly, pavers will outlast concrete and create a look and feel for your space that is hard to beat. We take the extra steps to build our paver projects on a compacted base above industry standards. If you are really wanting to spice up an outdoor space, a pergola is one of the classiest ways to enhance the feel of your deck or new paver patio. Most of our pergolas are cedar and installed in conjunction with a paver patio and fire pit. When shopping for your outdoor space you will get a variety of bids with a disparity of prices. As the saying goes, it’s not always wise to accept the lowest bid. As someone who has been in the industry for a while, I can offer a few helpful tips. For decks, the most important thing is the skill level of the carpenter. It doesn’t take a massive amount of brain power to build a frame and lay boards across to walk. The beauty of a deck is in the craftsmanship on how well the seams line up, how precise the railings line up, or how straight the decking is laid. It’s all the little things that are not done with excellence that will catch your eye with annoyance. For the structure of the deck, it is important to have a contractor that understands how much load the main beam can carry or how far the individual joist can span. The problems I have seen are joist that sag because they are too small or span too great a distance to hold up over time. If not built with the proper size, the main beam can also sag over time which become not only unsightly but a safety hazard. When hiring a company to install your paver project or retaining wall, you want to be sure they take extra care to build an 8” compacted base to eliminate settling and unsightly dips. 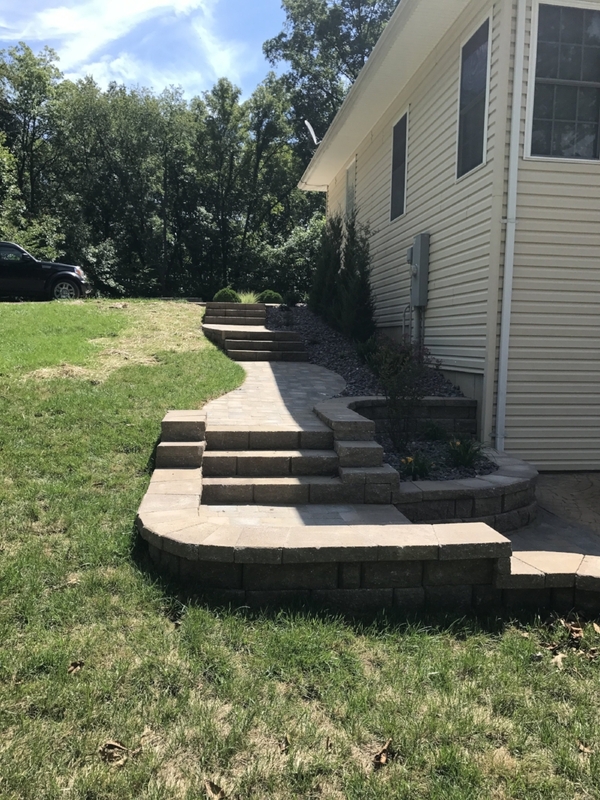 Per St. Louis County code, a 6” compacted base is required but the extra 2” gives the give peace of mind that the project will outlast you living at your home. It’s also important to note special situations when installing a new paver project on soil that is not virgin. For new construction, there are pockets around that foundation after back filling which leads to settling over time. Once your construction projects are complete, you will want to decorate your landscape with plants that fit the look you want. Pit falls to avoid are having plants in places they will outgrow in a few short years, or placing plants in locations not suitable for their temperament. If you wanting color or a screen, it’s important for your landscape designer to have a full understanding of each species suggested so that you don’t have half the plants languishing and half over grown for the space as time moves on.